SAME HAT! : NEWEST UMEZU FILM ADAPTION: Orochi! Quick post regarding cool news I plucked from Twitch (the best blog for fucked up international SF & horror films-- and they update about 30 times a day!). It looks like another Kazuo Umezu manga is getting the film treatment... this time it's the Orochi series. "Norio Tsuruta will direct the film and Hiroshi Takahashi (If it had a Ring in the title he was a part of it), who has worked with Kazuo’s material before, is providing the screenplay. And now for the talent in front of the camera. Yoshino Kimura [Sukiyaki Western Django] will be playing two separate roles, the older sister Kazusa, and her own mother. The younger sister Lisa will be played by Noriko Nakagoshi and the mysterious girl, Orochi, will be played by Mitsuki Tanimura. Taro Yamamoto [Battle Royale] plays Kazusa’s boyfriend. And here’s the storyline of this series from 1969 and 1970. We have our two sisters, Kazusa and Lisa. For Lisa, no matter what she does, her sister Kazusa has done it better. Lisa is always told that she’ll never be comparable to her sister. As any sibling rivalry is wont to do it results in feelings of jealousy and vengeance. As Lisa grows she learns to hate and at times lashes out at the sister she once loved. A tragic accident sets things in motion and so appears the mysterious young girl named Orochi." As with previous Umezu adaptations notwithstanding some cool parts in the first Tomie movie! (Whoops, that's lack-of-sleep talking! ), I have a feeling that they're gonna mangle the source material and go with a direct-to-DVD-esque film. We'll see. 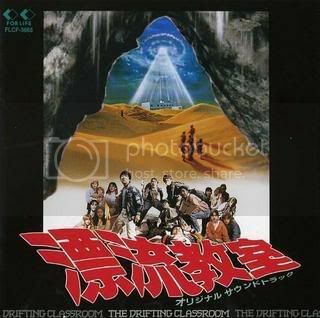 If you want a refresher on what amazing heights an Umezu adaptation can aspire to (I think I mean this both earnestly and ironically, somehow), check out our friend Clay's video review of the 1980s Drifting Classroom adapation. OH GOD, THE HORROR? Still, good news! Hopefully it'll eventually make it's way to the US and prompt some publisher to get the rest of the series in print over here. Yeah, it could potentially be an interesting film. Oh, speaking of Orochi in English, there is a group moving to scanlate the entire series-- I'm gonna post about them later this week. I would like to see more of the original...looking forward to the links.